On a global scale, we are reading like never before and are spending more and more time glued to a screen. In fact, we read digital media every single day, whether it is on Facebook or in discussion forums. In total, there are more than 180 researchers from 33 different countries participating in the COST-initiated research network E-READ, reading in an age of digital transformation. This network examines the effects and consequences of digital developments in terms of reading. We had a chat with Anne Mangen, Chair of the Action, working at the Reading Centre at the University of Stavanger. How much time do we spend reading on screen and what are we reading? The answer to this depends on how "reading" is defined. The research and statistics in this area vary depending on how the term is defined. Are we referring solely to the reading of textual material, or are we also including pictures, social media and hypertext containing links? If the latter definition is used, we can say that we are reading as never before and that the Internet has brought about an explosion of reading. From this perspective, we can remark that we read on screens every single day, whether it is email, "snaps," news, official documents or posts on discussion forums. It is interesting that while music and films have become almost an entirely digital affair, the sale of digital books in many countries is less than ten percent. However, after several years of rapid growth, it has now stabilised. 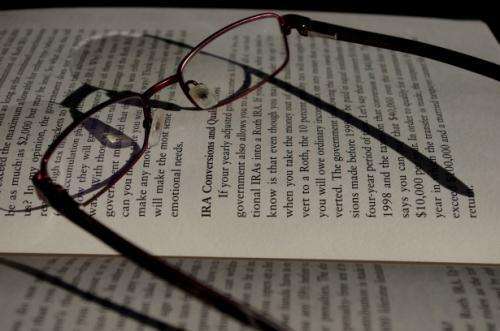 Even though it is possible to read using technical solutions such as a Kindle, even when it is not connected to the Internet, often readers do not find it as inspiring as reading a paper book. When do we prefer a printed medium, such as a book? There are many components, factors and conditions that can come into play here, such as the reader, the material, the purpose and the technology. Not only the reader's proficiency, background and expectations must be kept in mind, but also the type of material that is being referred to and the kind of screen that is being used. It is not a case of "one size fits all," but patterns are beginning to emerge from empirical research into the subject. The length of the text seems to be the most critical factor. If the text is long, needs to be read carefully and perhaps involves making notes, then studies show that many people, including young people such as students, still often prefer a printed book, even if it is available as both an e-book and in electronic formats with options for making notes, enabling the user to search for and highlight the text digitally. This is not the case when it comes to shorter texts. Do we read better or worse on screens compared to printed media? Again, it depends entirely on our definition of "reading" and what kind of text is being referred to. However, an interesting finding in some of the empirical studies is that we tend to overestimate our own reading comprehension when we read on screen compared to on paper. Some studies have shown that we believe we have understood the text better, when we read from a screen. However, it has been found that we tend to read faster on screen and consequently understand less compared to when reading from paper. This is a very new research topic and there are studies that have not found any differences in this area. As a result, a lot more studies are required to be able to make conclusions with any level of certainty. However, such findings do highlight something very important, namely that we may have a different mental attitude to what we read on a screen. This has very significant implications, including in the context of education. What is it with books that catches our attention? A book also has more physical attributes or characteristics that can suggest something about the content and the text, in comparison to a screen. While an iPad will always look the same, a book has different physical and typographic characteristics that can encourage a certain reading mode and can affect the way in which you read, for example, a thick and compact novel or a thin book of poems. A physics textbook obviously gives off different signals than a pocketbook by Dan Brown. It has something to do with seeing it and physically feeling that you are browsing in a book. What is E-READ researching and how is the research being conducted? "Reading" encompasses a wide range of factors, objectives and components, whether we are talking about reading for leisure or reading in the context of studies or work. For example, reading literature has proven to have a stimulating effect on the imagination and encourage the development of empathy. Reading has an effect on our ability to concentrate and for abstract thinking. We want to discover if such processes are influenced by the reading medium. E-READ is a research network that brings together reading researchers across paradigms and disciplines. We study a range of aspects including cognitive processes, understanding, memorisation and emotional processes such as empathy and sensitivity in literary reading. In the group I work with, we are looking at the neuropsychological and physiological aspects of reading. For example, we study the reader's eye movements and can see whether eye movements differ based on whether a text is rich in metaphors or other stylistic devices, compared to more action-orientated descriptions. Readers who participate in the study also answer questions in interviews and questionnaires about what they feel and understand when they read and how they experience what they read. In addition, new methods for measuring emotional processes have been adopted by the network. This includes everything from advanced technology that registers muscle activity in the reader's face to electrodes attached to the head, which can show how readers respond emotionally to what they read. What do you believe should be researched in more depth within the field of reading research? I would like to see more empirical, interdisciplinary research into how people read different types of continuous, ideally longer texts and the extent to which they are aware of their own reading, in terms of efficiently reading the largest volume possible, for different purposes. There is a need for more empirical research on reading comprehension in terms of screen reading and also on the subjective reading experience. We need to know more about the components, factors and conditions that come into play when reading different types of texts on different platforms and map out the differences. We also need to know a lot more about how children read on different types of screens. What is happening within the E-READ research network at the moment? There is a lot of activity and many experiments are in progress in the various work groups. Last year we published an article presenting the theoretical framework for COST E-READ. This article was also shortlisted for the UKLA Wiley-Blackwell Award in 2017. I recently attended the ECEM (European Conference on Eye Movements) Conference, the largest international conference for researchers using eye-movement technology in their research. During the annual conference, a symposium with literary texts was organised for the first time in ECEM's history, demonstrating how Shakespeare's sonnets were used as stimuli in our research network. Often, the stimuli, i.e. the text material, consists of eye movement studies using short texts often written by the researchers themselves in order to maximise control of the facet being measured. They are often single sentences or letter combinations that are manipulated in different ways, for example by replacing one word or letter with another and comparing the response. By using literary texts such as chapters from novels by professional authors, we can obtain a more nuanced, realistic impression of how we read. Such texts are written in order to facilitate often complex reading experiences, regardless of what an individual experiment may focus on. Reading of longer literary texts that can be both cognitively and emotionally challenging is, in my view, particularly interesting and important to study. This is where we come back to "Deep Reading," which I believe is particularly important to focus on in this digital age. Next year we will also arrange a closing conference for E-READ in Stavanger, where one of the world's most well-known reading researcher, Maryanne Wolf, will come and talk about "Deep Reading." More information: Mangen, A. & Van der Weel, A. (2016). The Evolution of reading in the age of digitisation: an integrative framework for reading research. That is why E-ink displays are the most popular form of ebook currently. They mimic the look of ink printed on paper, allow you to hold the book in one hand while relaxing in any position you could read a regular book and ease eye strain since you can increase the font to your comfort level. Being able to have hundreds of books to read through is a nice side benefit along with having back lighting available for reading at night. If I had to keep a physical copy of every book I own, I would need more space than my local library can claim. As is, both children have a copy of a good portion of my collection, including tens of thousands of public domain works. If we have a fire, we only lose the readers and copies of the books. The collection itself is backed up to multiple cloud locations and is retrievable. Yes it was more expensive to start with, but many ebook sites have sales and bundles giving people like me a chance to collect everything we want.